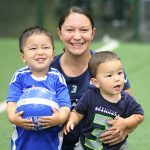 Whether your child is new to soccer or has already developed a love for the game, our classes are tailored to how kids learn at different ages and available to all skill levels. Give your child a head start to future success – in school, in sports, and in life. Join the 1,000,000 Lil’ Kickers who love to have FUN! Our convenient class times provide families options to accommodate multiple children and busy schedules. Find a day and time that works for you! New customer may try their first Lil’ Kickers class for free. *To help you find the best class time, all fields are required. ---18-24 mo.2 yrs.3 yrs.4 yrs.5 yrs.6 yrs.7 yrs.8 yrs.9 yrs. Which day(s) of the week work best for you? Ready for Lil' Kickers fun? Yes! Please contact me to schedule my free trial.